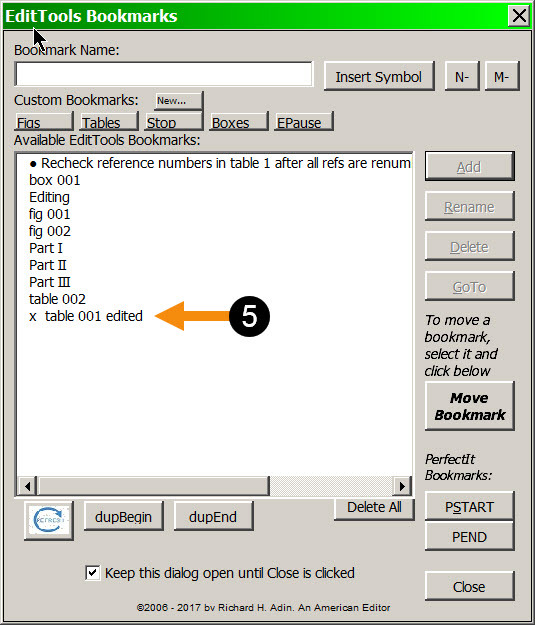 EditTools’ Bookmarks are much more powerful and usable than the standard Word bookmarks. 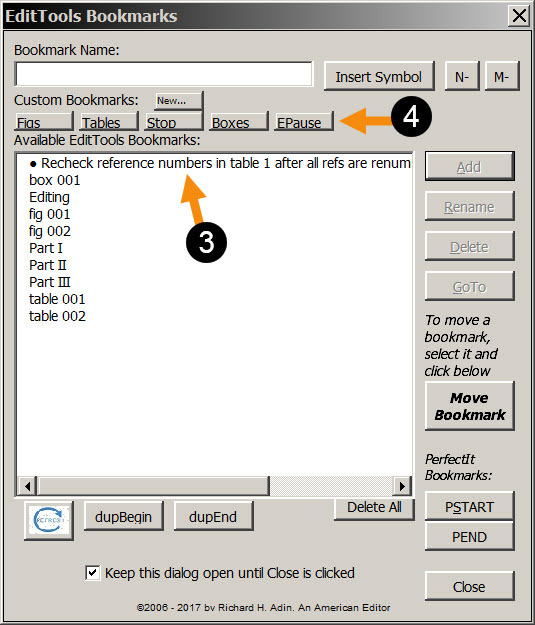 A detailed description of the Bookmarks macro is available at the wordsnSync website; here I want to address how I use bookmarks in editing. My first use is to mark callouts of display items in the text. It is pretty easy to recall that Figure 1 was called out in the text when a manuscript has only one figure, but if a chapter is 50 pages long and has ten figures and six tables (and perhaps other display items), using bookmarks makes it easy to confirm that all are called out in the text. I insert a bookmark at the first instance of an in-text callout of a figure or table (see arrows [#1] in figure below) (you can make this image, as well as other images in this essay, larger by clicking on the image). When I get to the section of the manuscript that has, for example, the figure legends, I match the callout bookmark to the figure legend — that is, when I am styling/coding the legend to Figure 3, I make sure that there is a callout in the text for Figure 3 by looking at the above dialog to see if there is a bookmark fig 003. If there is, I use Move Bookmark (#2 in above figure) to move the bookmark from the callout to the legend. I do this is so that when I am editing the manuscript (rather than styling/coding), I can go from a figure’s callout to its legend (I insert a temporary pause bookmark at the callout so I can easily return to that spot), edit the legend and make sure the figure and the text are aligned (addressing the same issue), and then return to where I had paused editing. If there is no bookmark for the callout, I search the text for it; if it remains unfound, I query the author. Using bookmarks at this stage of the editing process gives me an easy way to check that all display items are called out in the text. There are two other things I do with bookmarks that help with editing. 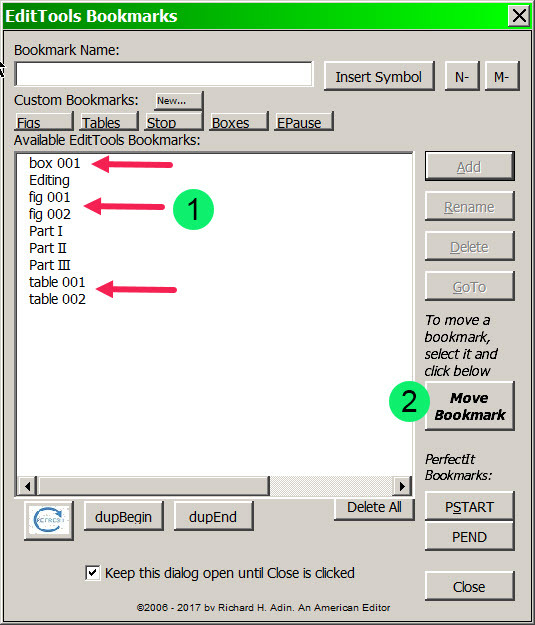 First, when I have edited a display item, such as a table, I rename the bookmark — I do not delete it because I may need to return to the item and this is an easy way to navigate. Renaming is easy and I have chosen a default naming convention as shown below (#5). Bookmarks that I no longer need, I delete. I like to keep lists that I need to check to a minimum. Thus, for example, once I have rechecked the reference numbering in Table 1, I will delete the bookmark that acts as both a reminder and a marker. In my editing process, I use bookmarks extensively, especially as reminders to do certain tasks before I decide that the editing of the manuscript is complete — essentially a to-do list for the document I am editing. Unlike Word’s Bookmarks, EditTools’ Bookmarks lets me use plain-English descriptive bookmarks and organize them. 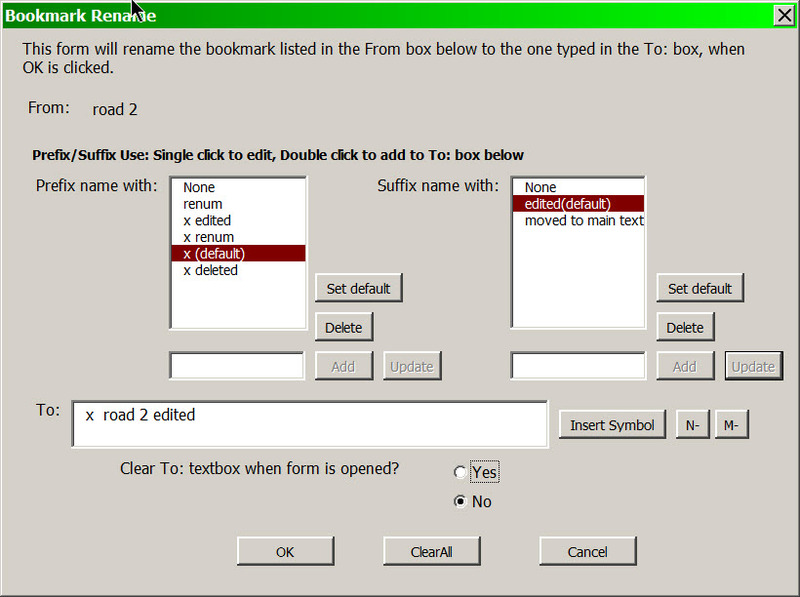 Note that the bulleted “Recheck” bookmark appears as the first entry and the “x” (to signify edited) renamed bookmark has moved to the end of the list. The next step in my editing path is to create my project-specific Never Spell Word dataset. When I first begin a project, this dataset may have only a few items in it, but it grows as the project progresses. Never Spell Word is the subject of The Business of Editing: The AAE Copyediting Roadmap V. Never Spell Word is a key item in my editing roadway.